Chi-Squared Tests: Rock, Paper, Scissors. At the beginning of the school year, I shared a post about a fun Rock, Paper, Scissors applet on the New York Times website. Back then, my class used the applet to collect data for 2-way tables, and considered appropriate methods for displaying the data set. Teams played the game in veteran mode. 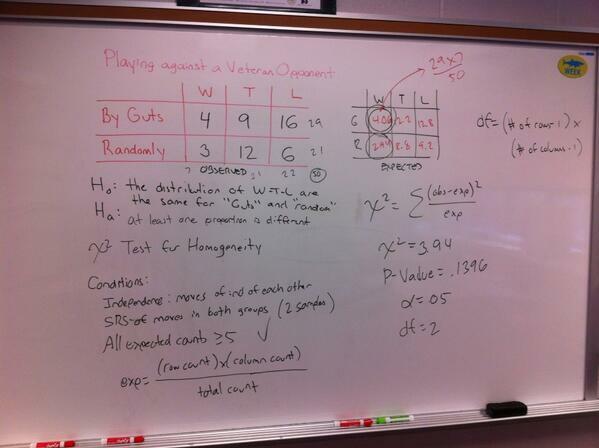 In round 1, teams were given 3 minutes to play the game normally, which I’ve labeled the “guts” method. In round 2, teams were given 3 minutes to play the game randomly, using “randint” on their calculator to generate a digit from 1 to 3, which corresponds to a move. We then considered an appropriate test for assessing the data. This comes on the heels of Chi-Squared Goodness of Fit tests. But here we have two samples, and we want to determine if the proportions are similar in both samples: this was our first test for homogeneity, and it was easy to move through the mechanics of the test. Doug Page also shared a worksheet he has developed for using the Rock, Paper, Scissors applet. I do not have contact info for Doug, but I hope he provides some details on his success in the comments. This activity will now become a yearly staple in my AP Stats arsenal! Enjoy. I completed the Chi Square worksheet on the RPS and it worked out well. My class was a little further along when I introduced the activity. They had been exposed to both homogeneity and independence, but just before Spring Break. So on the second day back (nothing really gets done well on the first day back), I introduced the activity. As I expected, it really teased out the issue of homogeneity or independence. Many thought it was independence (and with good reason) because we collected the data all at once. But the exercise of thinking about how the game was played (or how I had them play the game – 10 games at a time doing NG, NR, VG, VR) had them thinking and discussing. They did a good job assessing whether their results were truly random using the Goodness of Fit Test. They seem to understand quickly that the GOF test was appropriate and that the expected counts would 1/3 of total count for W,T, L. It was interesting discussing whether they should use the Novice, Expert or both. We also taking about whether we could add the Novice and Expert data together. I also plan to use this activity in the future. I like it’s multiple uses and it definitely generates interest. I think next year, I’ll have them play the game over again for each activity. My students have a unit test tomorrow and a number of them were using the worksheet and discussing Chi Square and the issues. Always a good sign. Thanks for leading the way with these activities and using the NYT rock, paper, scissors! I wonder after doing it with “Rock Paper Scissors” would it be worth it to step up to “Rock Paper Scissors Lizard Spock” with each other and see if different patterns emerge.